Like all connoisseurs in imperial China, the 17th-century playwright Li Yu took very seriously the art of displaying fine pieces: “Displaying objects in the correct way is as essential as promoting talented people to a high position” . He recorded his views on every aspect of elegant living, ranging from architecture to the arrangement of items on the desk. Some of his views are baroque and may have been controversial at the time. He had a taste for opulent visual effects such as irregular polygons of wallpaper patched together to imitate the surface of cracked porcelain. 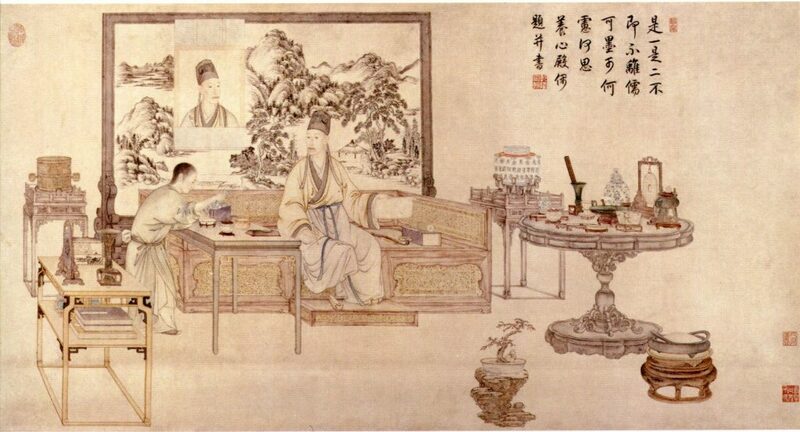 Such inventions would probably have been termed su (vulgar) Wen Zhenheng, gentleman scholar and author of the Treaty of superfluous things . But all agreed that providing a worthy environment for treasured objects was an important part of a collector’s activity. In particular, finding a display stand was a way to participate in the creation of the work of art, considered as a continuous process that could span several centuries, and imply the collector as well as the artist. The Yongzheng emperor (r. 1723-1735) commissioned the famous set of painted scrolls known as Guwan tu (Playful things) to serve as a visual catalogue of imperial collections. Several of the scrolls are still extant, and hardly any piece is depicted without a stand. Some antique bronze vessels are fitted with wooden stands (and covers) of more recent manufacture. Indeed regular commissions of stands are recorded in the imperial archives. 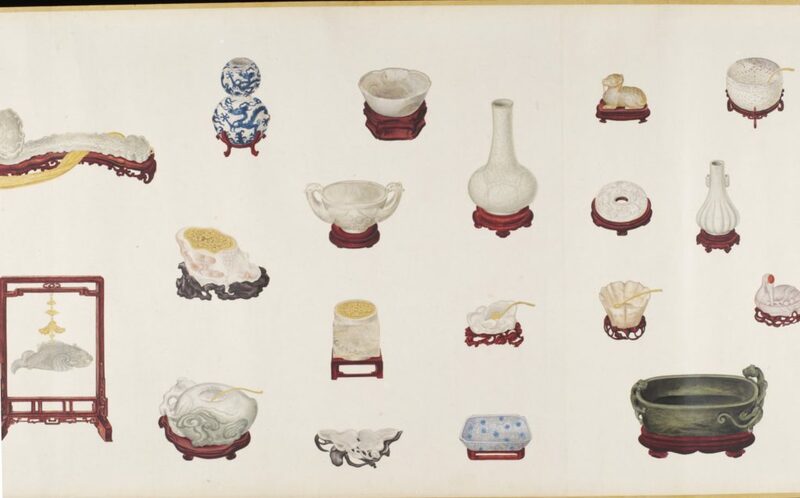 Genre paintings, illustrations of novels and depictions of the hundred antiques confirm the extensive use of display stands in the classical Chinese living environment, not necessarily in an imperial context. Beauty and practicality were combined in stands. They provided stability to meiping vases and rocks of elaborate forms, some of which defy gravity. Even though the stand was not meant to distract the viewer from the contemplation of the object, it could complement it by a continuity of style, or by deliberate contrast between materials (through the association of a hardwood stand to a bamboo object, for instance). The best display stands share all the characteristics of antique Chinese furniture. The craftsmanship obeys the same rules: it is based on mortise-and-tenon joinery, with minimal use of glue, if any. 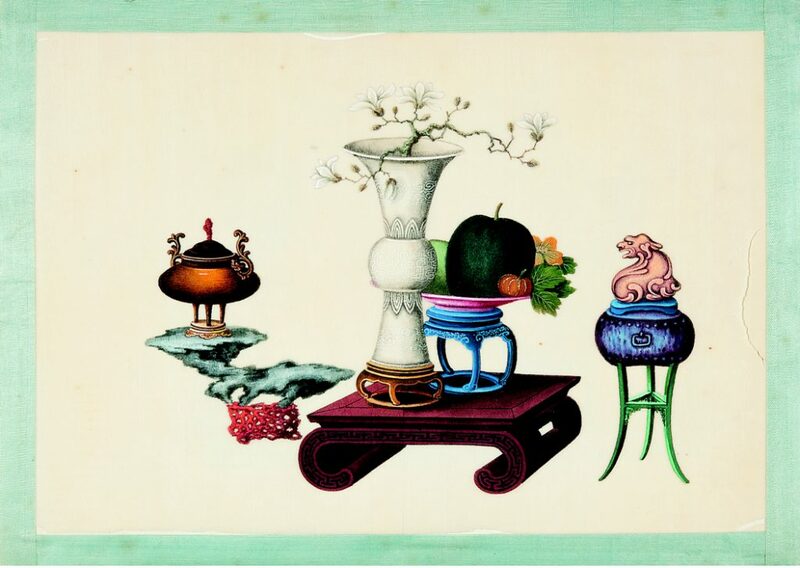 Wooden stands can therefore serve as witnesses of the artistic evolution of Chinese furniture. The materials are just as refined in stands as in full-scale pieces of furniture. The rarest tropical hardwoods, such as huanghuali, come from slowly-growing trees. The small scale of stands makes them natural candidates for the use of finely-grained but small pieces of wood. When tropical woods started to be imported in large quantities in China in the late Ming dynasty, the taste of the literati was dominated by the purity of simple geometric shapes. The patterns of the highly-figured grain of huanghuali was termed ke ai gui mian (adorable demon faces) by Ming scholars. In some Ming-style stands, the grain of the wood is the only ornament of the piece, which lends them a surrealist quality. Their appeal therefore reaches far beyond the culture in which they were produced. On the other hand, stands made during the Qianlong era of the Qing dynasty (1736-1796) combine dramatic effects such as asymmetry and contrast between essences of wood, to ornaments that range from archaic patterns inspired by antique bronzes and jades to symbols treated realistically. Moreover, the distinction between furniture and stands is ultimately conventional. The two categories are almost merged by the existence of miniature tables, which can be considered as self-sufficient works of art, or as stands. There is a continuum of scales between the corner-legged stands and the smallest kang tables. Another border-line case between stands and furniture is the duobaoge, or multiple-treasure shelf, a type of shelf with irregular compartments, each fitted to display one object. The smallest extant duobaoge function well as table-top cabinets, and almost fit into the category of scholar’s object. On the other hand, a duobaoge can take the proportions of a floor-to-ceiling display shelf. Examples of architectural proportions can still be seen in the Palace Museum in Beijing , and are described with minute precision in Dream of the Red Chamber, the well-known 18th century novel by Can Xueqin. The interest for display stands as collector’s items is therefore artistically grounded in the exquisite craftsmanship that matches the quality of the works of arts they were meant to support. It should also be noted that market forces have recently triggered this interest, and will continue to do so. The scholarship on Chinese furniture developed extensively since the American embargo on mainland China was lifted in 1972. The corresponding market went global and commanded increasingly high prices. 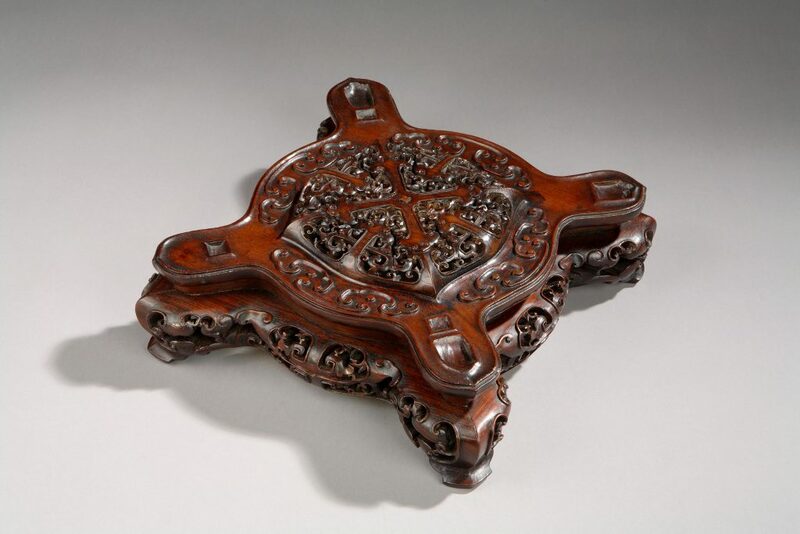 Since the Wang Shixiang collection was exposed in the Shanghai Museum, it has become increasingly difficult for the private collector to acquire genuine pieces of Classical Chinese furniture, even though the amount of knowledge available from the literature and from museums enables connoisseurs to develop and refine their taste. As a result, the attention of demanding collectors has been attracted to smaller pieces that retain all the features of classical Chinese furniture, even though they have been separated from the objects they once supported. 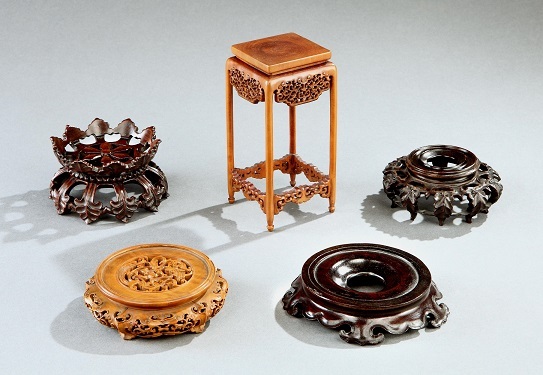 Chinese wooden stands have now developed as a autonomous collecting field, with outstanding published collections documenting Ming and Qing stands in a variety of woods . contemporary collectors can speculate, as an educated guess, about the nature of the object for which some one-of-a-kind stands were made. Once can even pursue the archeological dream of reuniting a stand to a matching object, thereby continuing the Chinese tradition of involving the beholder in the life of a work of art. [ 1 ] J. Dars, Les carnet secrets de Li Yu, un art du bonheur en Chine (2009), Éditions Philippe Picquier. [ 2 ] Craig Clunas, Superfluous Things, Material Culture and Social Status in Early Modern China. University of Hawaii Press (2004). [ 3 ] Forbidden City Publishing House, Interior design in the Forbidden City. [ 4 ] P. Mak, The Art of Chinese Wooden Stands, the Songde Tang collection, University Museum and Art Gallery, the Chinese University of Hong Kong.